It was lovely to receive an invitation to return to Fleetwood HS to share the latest update on my writing adventure. As the Y7 students entered the hall, it was great to see lots of familiar faces from past primary visits. It was a joy to share Danger Zone with the students. They saw the multiple drafts involved in creating the book and we even saw how Martin creates Eric. 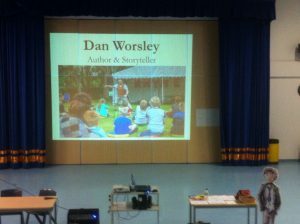 To finish the session, I put on the storytelling waistcoat to share a Tale about a crime-fighting wig. The students listened fantastically well and they laughed at all the right bits. Fantastic! Thanks must go to Mrs Clempson for organising the session. It was my third visit to Fleetwood HS and I have got everything crossed for a fourth in 2019.